Tomorrow is a crucial day for Turkey. The past few years, marked by tumult and repression, have led up to a constitutional referendum that will help decide the country’s future. If approved, the amendments would install a state system with a dictatorial president at the center. The referendum is the culmination of a deep-running hegemonic crisis in Turkey. It is also the culmination of various authoritarian measures intended to fix that crisis. Considering the current balance of power, it seems unlikely that the referendum will resolve the crisis. What will truly determine the future direction of the country is the political struggle around the referendum itself. First, however, it is necessary to trace the path that led to the present. As we have argued elsewhere at length, the failed coup attempt in Turkey last July was the most violent and direct expression of a hegemonic crisis long in the making. Since the 2013 Gezi Uprising, large portions of the population have withdrawn their active consent from the existing order, embodied and organized by the ruling Justice and Development Party (AKP). As such, it is equally a hegemonic crisis of the AKP: the differences between various factions of the bourgeoisie escalated into deep fissures, a war for power within the state broke out, and the coup attempt was the result. On the night of the would-be putsch, two erstwhile archenemies in the military formed a fragile alliance: the traditionally secular Kemalist elite and the followers of the exiled Muslim cleric Fethullah Gülen. (Some careerist opportunists also joined the coup.) Although we still lack crucial details about that night, it’s clear that the coup failed mainly because the putschists’ plans were exposed, forcing them to take action much earlier than they’d planned, and in a less coordinated fashion. It is also likely that leading Kemalists in the putschist camp betrayed the other coup plotters and jumped ship in the final minutes before the coup was launched. What has transpired since is well known: an unending “state of emergency” and a massive purge within all state apparatuses, Turkish president Recep Tayyip Erdoğan and his AKP presenting themselves as strongmen all the while. At last count, around 134,000 people had been dismissed from public service; upwards of 100,000 had been detained; roughly 2,100 schools, dormitories and universities had been shuttered; more than 7,300 academics had lost their jobs; 149 media outlets had been shut down; and well over 200 journalists had been arrested. While initially the purges were mostly directed at real or alleged Gülenists, the attacks quickly broadened to include all oppositional elements, including the Left in the broadest sense: i.e. persons even loosely associated with the Kurdish movement, leftist Kemalists, and Turkish socialists. Turkish prime minister Binali Yıldırım’s vow last August that the government would fight sympathizers of the militant Kurdistan Workers’ Party (PKK) within the state signaled the expanding scope of repression. In October and early November, the Kemalists’ media flagship, Cumhuriyet, and the leading figures (including the co-chairs) of the pro-Kurdish leftist Peoples’ Democratic Party (HDP) were detained. In December, the state unleashed a huge detention wave against the HDP and the Democratic Regions Party (DBP), a local pro-Kurdish leftist party, following two big bombing attacks by a Kurdish militant splinter group. In February, an executive directive ordered the dismissal of thousands of mainly leftist teachers and academics. The boot of the state has come down especially hard in the predominantly Kurdish southeast (also known as North Kurdistan). The state has replaced more than eighty democratically elected municipalities with Ankara-appointed trustees, literally establishing direct colonial rule. Since the June 2015 elections, according to an unpublished HDP report, ten thousand active politicians, members, or sympathizers of the HDP (and its sister party in Kurdistan, the DBP) have been detained, at least three thousand of which were subsequently arrested. Twelve HDP members of parliament, including co-chairs Selahattin Demirtaş and Figen Yüksekdağ, still languish in prison. The AKP’s aim is clear: to completely paralyze the organized democratic opposition. Following the coup attempt, the AKP didn’t simply turn inward. It swiftly sent troops into Northern Syria. In the preceding years, Turkey’s priorities in Syria had changed quite substantially, shifting from toppling Bashar al-Assad to preventing the formation of a united Northern Syria Federation dominated by a PKK-friendly Kurdish movement. The invasion was facilitated by a shift in intra-state alliances. As the chasm grew between Gülen and the AKP/Erdoğan — who had once counted each other as allies — the AKP forged bonds with some of their former enemies, including ultranationalist Kemalists in the military and their political representatives. Doğu Perinçek, a Maoist-turned-fascist, was key to this shifting alliance. His party, the far-right, national socialist Patriotic Party (VP), is largely helmed by former high-ranking military and intelligence officers. Ideologically, they represent the so-called Eurasian faction within the Turkish state: the faction that favors relations with Russia and other Central Asian countries over Europe and the US (and is said to have managed Turkey’s rapprochement with Russia and Syria). Other far-right elements are also ascendant. In the coup’s aftermath, the AKP extended a hand to the majority trend within the fascist Nationalist Movement Party (MHP) around party leader Devlet Bahçeli. This alliance was enabled by the AKP’s hardening attitude toward Gülen, along with the invasion of Northern Syria and the party’s nationalist-chauvinist rhetoric toward the Kurdish liberation movement. The pro-NATO majority within the Turkish military also signed off on the Syrian invasion, backing the AKP and the MHP in their anti-Kurdish position. Turkey’s invasion would not have been possible without the tacit or direct approval of all the main international players involved in the Syrian war. The US accepted the move, presumably in order to mollify Turkey’s strong anti-US stance in the wake of the failed coup; Russia and Iran okayed it on the condition that Turkey concede Aleppo to the pro-government alliance, and abandon its call for Assad’s ouster. The incursion restricted the Kurdish movement’s ambitious project in Northern Syria, which seeks to establish a radical, anticapitalist council system. While Kurdish forces are engaged in tactical alliances with foreign powers in Syria, they are of best use to these powers when their strength is held in check. The limits of Turkey’s invasion were apparent from the very beginning: any move to topple Assad would raise the hackles of Russia and Iran, and any move to assert its authority in reorganizing Syria or Iraq would upset the US. At this point, precisely because of those limits, the best Turkey can hope for is a Pyrrhic victory. The militarist venture has now itself become a source of crisis. While the massive purge, detentions, and forced closings were aimed at annihilating the entire right-wing and left-wing opposition, the war against the Kurds has once again united the majority of the right-wing camp behind the AKP as the leading political subject of the state and society. Erdoğan has been as successful in consolidating the AKP around his own person as he was in presenting himself as the leader of the state and the AKP as the main power source that could solve the hegemonic crisis. In the process, Erdoğan completely neutralized the main opposition party, the centrist Republican People’s Party (CHP). The CHP mainly follows an anti-Islamist, strongly secularist, yet steadfastly etatist line. As the founding party of the Turkish Republic and as “Atatürk’s party,” it forever carries with it the character of the state party par excellence. That is why its ability to act as a countervailing force against the AKP was so easily negated. After the coup, the CHP managed to mobilize hundreds of thousands of people to protest the coup and the AKP’s state of emergency in Istanbul’s Taksim Square. But as soon as Erdoğan’s evoked the “unity of the nation and the state,” the CHP’s opposition disappeared. On August 7, the CHP leadership joined the first genuine post-coup pro-AKP mass demonstration, an attempt to rebuild popular support for the then-crumbling AKP. The CHP leadership threw its support behind the anti-Kurdish alliance and, consequently, approved the invasion in Syria as well. Recently, the CHP even demanded that Turkey implement sanctions against the Netherlands after a diplomatic row between the two countries. In doing so, the CHP claimed that what was at stake was a “matter of national interest” that had nothing to do with the referendum. As the state party par excellence, the CHP once again has opted to prioritize the “unity of the state” instead of building a democratic opposition. Ironically, the AKP’s machinations are destined to plunge Turkey more and more into a battlefield of international powers and internal cliques. Thus, in a dialectical twist, the CHP’s founding rationality has yielded unmitigated irrationality. Seeing a situation in which the main antagonists within the right-wing camp were destroyed or in disarray, the majority trends within the other sectors of the Right were supportive of Erdoğan’s course, the military was happy that it had been swiftly rehabilitated and was able to wage war again, the centrist opposition and its mass potential were defanged, and the legal democratic and socialist opposition were suppressed, Erdoğan and the AKP eagerly made a push for their long desired project: the constitutional enshrining of a dictatorial presidential system. Erdoğan and his circle were well aware that they had to profit from their “moral superiority” after the coup, as their footing was unstable and the state apparatuses lay in tatters. In order to shore up their hegemonic position, they had to turn the “moral superiority” into a concrete material success before the momentum ran out. The attempt to secure a dictatorial presidential system originates in that very conundrum. In January, with the full assistance of the MHP, Erdoğan’s forces won a parliamentary showcase debate and set a date for the referendum. What then, are the most important proposed constitutional changes? First, the president would be anointed the chief of state and the executive. As such, he (and indeed, Erdoğan is the obvious intended beneficiary) would have the power to appoint the entire ministerial cabinet, appoint an unspecified number of ministers and deputies/aides, and grant them whatever scope of rights and duties he deemed necessary. He would have the permanent and unchecked power to issue presidential decrees that carry the force of law, with no stipulation that he remain impartial (i.e. he could be de jure and de facto leader of a political party). He could call snap elections for parliament and himself at any time, and would control the state budget. Parliament, on the other hand, would lose both its ability to check the president and ministers and its right of interpellation. The president’s veto power against parliamentary legislation would be strengthened (even though the president would most likely come from the dominant party in parliament). Bringing parliamentary charges or initiating an investigation against either a minister or the president would have to go through a byzantine process. And if such a complicated and massively hindered parliamentary inquiry were successful, ministers and the president would go before the constitutional court — whose members are mostly appointed by the president himself. In short, the amendments seek to set up a presidential dictatorship, whereby parliament is reduced to a theater, division of powers exists mostly in name only, and the president is able to enact laws, name ministers and aides, and establish public institutions while elections only function to enthrone the next dictator. Procedural and symbolic elements of a standard bourgeois-democratic order would be retained only as a facade to obfuscate the system’s dictatorial nature. And the AKP’s hegemony would be stabilized. At least that’s what the AKP and Erdoğan are hoping for. First, let’s look at the Yes camp. In their efforts, the AKP is assisted by the dominant trend in the fascist MHP (the party’s minority current is fighting their involvement). Apart from the AKP and MHP, the Yes camp comprises the right-wing, nationalist-Islamist Great Unity Party (BBP) and the Free Cause Party (HÜDA-PAR), the legal formation of the Kurdish Hezbollah in Turkey, which acts as an illegal counter-guerilla against the PKK and PKK-friendly formations. Apart from calling upon grossly irrational and authoritarian grand myths and phrases (“strong Turkey,” “new War of Independence,” “historical showdown with the evil powers,” “Yes as the manifestation of struggle against imperialism and colonialism,” etc. ), the main arguments of the Yes camp can be grouped into three categories. First, plain and simple — threats. When Deputy Prime Minister Numan Kurtulmuş said earlier this year that a “yes” vote would end terror, his message was clear: either support Yes, or we will unleash even more war and provoke counteractions by the PKK (“terror”). The same goes for Erdoğan, who time and again has proclaimed that those voting “no” are PKK supporters or continuing what the putschists tried to do. According to him, all No voters are terrorists and enemies of the state. Two AKP members (a provincial head and, more importantly, the AKP’s Austria head) have also asserted that civil war would erupt if Yes does not prevail. Second, Yes supporters argue that a strong president would deliver economic growth and lower unemployment. In the past, capitalists (or pro-capitalist elites) have at times made the case that a quasi-dictatorial executive (for instance, an unquestioned technocrat) would be best for the economy and the people. However, their logic is a bit hazy: the AKP has not even tried to explain how or why a dictatorial president would necessarily produce a better economy. Finally, supporters say the government would work much more swiftly and effectively if it were not for parliament and its chit chat, which blocks or delays decision-making. The European Union — though not wholly dictatorial — is constructed exactly according to this logic. The rise and fall of Syriza, the Greek leftist party, clearly shows that such a conception of politics is best for big capital; it is hardly any good for working people. Of these three, the first is clearly the predominant approach. Indeed, it is striking that the Yes camp is generally not trying to put forward a rational argument for its position (you will never see them discuss the changes amendment by amendment), but favors threats, invocations of grand myths, tales of dark evil powers and heroic wars of independence, and denunciations of the opposition. As with all supporters of pseudo-popular pro-capitalist dictators, the Yes camp formed around the AKP knows very well that it cannot win mass consent for its project with sober argumentation. They know they can only do so by stirring the most desperate, most reactionary tendencies within the populace and attempting to link their hopes for a better life to grand authoritarian dreams and a dictatorial political system that at best can supply the gratification of vicariously coercing those who are even weaker than themselves (the Kurds, the “foreign agents,” the “Gulenist terrorists,” etc.). A typical mistake, especially by leftist critics, is to mock the MHP and Bahçeli as mere puppets of the AKP. However, as the MHP drifts closer to the AKP, the AKP drifts closer to the MHP — in discourse as well as praxis, adopting more and more nationalistic rhetoric and nationalistic symbols (such as the “grey wolves sign,” the Turkish equivalent of the German Hitlergruß). The MHP itself is also gaining significant power: although historically their hegemonic function has been to act as illegal paramilitaries carrying out the most brutal warfare and performing extralegal executions against the Kurdish and leftist opposition, they have become a much stronger part of the “official” state, especially within the armed forces. AKP officials (including Yıldırım) have openly said that they will appoint MHP ministers if they win the referendum. What, then, of the referendum’s opponents? The No camp spans the entire socialist and democratic left, and also includes Republicans. However, we can hardly talk of a solid unity among these different actors. The two major parties represented are the pro-Kurdish leftist HDP and the centrist-republican, Kemalist CHP. The main line of division is, as usual, the Kurdish question. In addition to taking a stance against dictatorship, the CHP also employs arguments referencing the “unity of the fatherland” and “terrorism.” They criticize the AKP for fostering Kurdish terrorism by initiating peace negotiations with the PKK in the past, while also warning that a presidential system would introduce more divisions into the country — by which they mean that the Kurds’ “separatist ambitions” would intensify. There is, it should be said, a social-democratic and liberal camp within the CHP that leans toward an alliance with the HDP. But they are pressured and threatened by the party leadership to refrain from pursuing this line. The CHP has also cancelled joint meetings because of “too many HDP flags,” and over the course of the referendum campaign, some CHP-led municipalities have been told not to grant public spaces to No campaigners outside of the CHP. Similar reservations, if somewhat less openly pronounced, exist within the socialist and democratic camp. While the vast majority of the socialist left, as well as the Kurdish movement, are campaigning for No on similar grounds, and in cooperation, others like the United June Movement and the Turkish Communist Party are running their own campaigns. Both defend an independent socialist alternative while condemning the HDP and its socialist allies for purportedly being mired in Kurdish nationalism and for promoting parliamentarism, which supposedly tamps down the people’s revolutionary fervor. Their objections are longstanding: both formations have historically tended to regard Kurdish aspirations for self-determination — be it in the form of a separate state or democratic autonomy within the Turkish Republic — as separatism and a game that US imperialism plays on Turkey. For these socialists, the “Kurdish question” is frequently also seen not as a specifically national question related to the structure of the bourgeois Turkish republic and the country’s social order, but instead a problem of the Turkish working classes in general. As such, these socialists often prove to be more nationalist than socialist. That’s also why they in theory support the establishment of a “socialist republic,” but in practice stand against the constitutional amendments in order to save the “achievements of the Republic of 1923,” i.e. of the structurally non-democratic republic of the Turkish bourgeoisie. In addition to these organizations from the Left and center, the No camp also includes voices from the Right, even outright fascists. First, there are the groups in the fascist MHP that have sought to oust Bahçeli for some time. Drawing on the discontent and dissatisfaction in its voter base, they are running an intensive campaign against the constitutional change. The group is led by former Interior Minister Meral Akşener, who was partially responsible for the inhumane warfare and annihilation campaigns carried out by the Turkish state against the Kurds in the mid-1990s (crimes that Akşener later openly defended). This oppositional faction in the MHP has been pushing for a more independent course vis-à-vis the AKP for a couple years. In response, it has been suppressed by the AKP’s juridical interventions. The courts blocked what would have been an extraordinary MHP congress, where Akşener was planning to run for the MHP leadership. Polls had predicted a surge in the MHP’s vote total should Akşener become leader and then adopt a more independent course. All the leading figures of this opposition have already been expelled from the party, and local administrations have repeatedly tried to break up their gatherings. But the MHP’s voter base is deeply divided. A good portion — up to 70 percent, according to some polls — is antagonistic toward Erdoğan’s dictatorial plans. The MHP’s rank and file always favors Turkism and Panturkism over Islamism. The schism is now so wide that Bahçeli-loyal MHP supporters are physically attacking gatherings of Akşener loyalists. The chasm is at once part of and proof of the current hegemonic crisis in Turkey. It shows that not even chauvinism and warmongering can sustain the order. Secondly, there is Doğu Perinçek’s self-declared left, which is actually national socialist in character. Former enemies of the AKP, the Perinçek group was released from prison in 2014 and has, as noted above, become one of the most important allies within the pro-AKP state camp. Before the coup attempt, Perinçek asserted that Erdoğan had been “captured” by the “patriotic forces” of Turkey, referring to the AKP’s decision to end peace negotiations with the Kurds in the summer of 2015 and reinitiate a massive war. For Perinçek, the peace negotiations had been an American game to divide Turkey and the Middle East. Since then, Perinçek has adopted a much milder tone toward Erdoğan, rejecting the claim that the latter is establishing a dictatorship. Instead he’s focused on warning Erdoğan that the US’s alleged ambition of a stronger presidency would pave the road to his own end. A presidential system would, according to Perinçek, restrict the AKP’s power base, make a “Second Independence War” and a “national mobilization against terror on grounds of a National Resistance Economy” impossible, and lead to a “mafia-like” state. Perinçek’s Patriotic Party (VP) is particularly interested in mobilizing those sections of the MHP base that are not fond of the fact that Bahçeli turned the party into the AKP’s right fist. A more serious MHP-VP fight appears imminent. Thirdly, there is Muslim opposition to the AKP’s plans. This could be described as a “right” opposition, insofar as they all tend to value conservative norms and conservative interpretations of Islam. However, this does not mean that they are all fascists or even anti-democratic (though some of them most certainly are). Opposition from Muslim quarters takes a few different forms. First of all, there are the democratic conservatives, mostly from the ranks of working people and intellectuals. In general, they support the AKP and the implementation of Islamic values. But they do not support installing a dictatorship or brutally suppressing pluralism. Their opposition is stoked by the fact that the AKP increasingly reinterprets and recalibrates Islam and Islamic rituals in ways that are seen as blasphemous. Erdoğan, for example, is referred to and portrayed in a manner that’s supposed to be reserved only for the Prophet Muhammad. The democratic conservatives are flanked by the more middle- and upper-class pragmatists/opportunists within the Islamic camp, who would rather stop antagonizing oppositional and different-minded people for the sake of stability. Leaders of this camp are former high-ranking AKP officials, such as ex-President Abdullah Gül and ex–Deputy Prime Minister Bülent Arınç. While the latter in particular can hardly be called a democrat — on the contrary, he is a staunch authoritarian — he seeks to style himself as the country’s top democrat. Then there are those Muslims who have family members in Europe or are frequent visitors of Europe. They have absolutely no interest in creating antagonistic relations with Europe. The feuds that have recently flared up between the Turkish government and various European countries make them uncomfortable. Finally, there are the millions of so-called “FETÖ victims.” As mentioned, more than one hundred thousand people have been dismissed from public service for belonging to the “Fetullahist Terror Organization” (FETÖ) — a wide net indeed. The Gülen community gained popularity and followers by giving grants and free dorms to children of poor families and enabled many to study at good schools and universities. Many of those children and their families are not in fact members of the Gülen community, let alone putschists or terrorists. Yet everyone who had even a remote connection with the Gülen society has now been sentenced to social death — which, when families are included, amounts to millions of people. This group was mostly supportive of the AKP as long as things were going smoothly. But now, they are also hostile to the AKP’s dictatorial plans. The latest polls show that Yes is slightly in the lead (roughly 52 percent to 48 percent). However, polling companies are careful to avoid making any conclusive statements — a significant share of voters do not articulate their preferences, either because they’re undecided or afraid — and traditionally, polling companies are guided by political interests and thus unreliable. In any case, the referendum seems to be a neck-and-neck race. The government has been stepping up its repression against No campaigners, especially from the HDP. In the course of just two weeks, two thousand HDP members were taken into custody. At this point, the HDP is hardly able to campaign in many cities due to a lack of cadres. It is not even clear if there are enough resources left to organize an international delegation to cover the elections. The group is also the target of smaller-scale suppression. HDP songs are widely forbidden, and the governor in the second largest Kurdish city ordered the removal of the party’s No posters. On top of that, following calls by the AKP, the High Election Board prevented 164 CHP and HDP members from serving on election commissions at polling stations in Siirt, Mardin, and Batman. The AKP is clearly panicking in the face of a declining Yes vote. Pseudo-judicial maneuvers such as moving ballots and removing the eligibility of presumed No supporters have been increasingly used in recent weeks. In this context, to speak of a more or less fair election is nothing but a farce. From a leftist and democratic perspective, it would obviously be much better if No prevails. But we should also reject the legalist illusion that a No in itself would lead to a more democratic AKP or to a genuine democratic alternative. The AKP has not accepted any adverse electoral results over the last years; we shouldn’t expect them to do so now. They have plenty to lose and are operating under an “all or nothing” logic. However, we should equally avoid the opposite legalist illusion: namely, that a Yes victory alone would directly produce a strong dictatorship. Given the current balance of power, the hegemonic crisis would likely intensify, albeit in a very different form. Ultimately, it will all come down to the level and character of mobilization leading up to the referendum and the specific result. What, then, is the nature of the current balance of power, what crisis moments did it produce, and why is the slide toward fascism, though real, a structurally weak one? One of the main (and mostly overlooked) elements of the hegemonic crisis is a powerful antagonist: the PKK. A remarkably resilient group, the PKK does not seem to have been critically harmed (militarily, socially, or politically) by the state in the urban warfare of 2015–16 and the accompanying aerial bombardments of the Qandil Mountains. To be sure, many Kurds have not been entirely supportive of the barricades-and-trenches tactics of the PKK’s urban guerrilla formation, the YPS. However, by now, they are much more hostile to the Turkish state, which they blame for the barbaric destruction of over a dozen cities. It will now be difficult for the Turkish state to reassert itself as a civil apparatus in the Kurdish regions, legitimizing its presence through at least partial consent. Its appointment of colonial trustees has been the logical consequence of such a failure, but it only fosters a further erosion of the state’s power by consent. Closing the political sphere for Kurds is also counterproductive from the state’s standpoint, as more Kurds end up joining the PKK’s guerrilla formations. What’s more, the longer the pro-government forces’ representation of the struggle between the Turkish state and the PKK diverges from the reality, the weaker the state will appear and the less equipped it will be to generate consent by means of repression within state and society. This directly affects the fragile intra-state alliances, which are one of the most likely sources of a potentially new crisis. Lacking talented cadres, social control, and specific skills, the AKP is dependent on other actors, who therefore retain relative autonomy. The AKP needs the military’s pro-NATO leadership for its skills and weapons to use against the Kurds and to prevent another coup attempt. They need the MHP as a parliamentary ally, to fill in gaps in the military, and corral enough nationalists behind Erdoğan. They need Perinçek’s VP for military reasons, but also to improve its ties with Russia and Syria (Perinçek’s VP has excellent relations with both). These factions will ally with the AKP as long as they can expect a certain return — and as long as they do not trust themselves to take the AKP’s place. At the same time, the PKK is straining the intra-state alliance because its actions show that the leader (Erdoğan) cannot cope with an outward enemy. 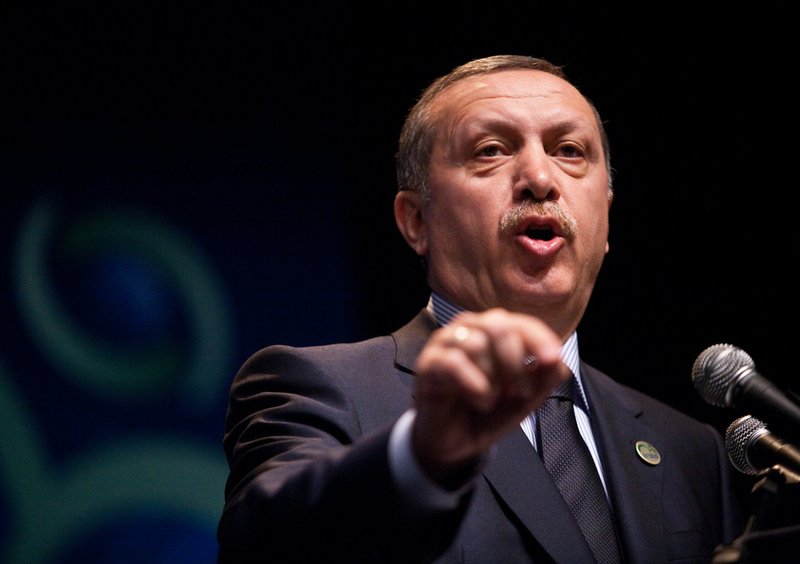 Those now rallying around Erdoğan are by no means unshakeable partners. Enemies have entered tactical alliances that could easily fall apart any given day. We shouldn’t forget that many of last summer’s putschists were actually those who had been on the frontline waging the war against the PKK. Any destabilizing event (strong reactions by the European Union, economic crisis, flagging success in fighting the PKK, etc.) could prompt the now-allies to turn against one other — and particularly against Erdoğan and the AKP — in order to take power into their own hands. That is a crucial aspect of the process of fascization: if controlling power in a legally unchecked or arbitrary way becomes the main method of politics, each organized political subject with some level of self-consciousness and control will try to posit itself as the sole source of power, i.e. as the sovereign. Fascism, therefore, tends to turn into a fight for power between different fascist political subjects. More visible cracks within the intra-state alliance are already appearing. Journalist Hande Fırat, who gained fame for speaking with Erdoğan on live television via FaceTime the night of the coup, recently published a piece in the daily Hürriyet under the title “Karargâh rahatsız” (“The Headquarters feels uncomfortable”). Citing “military sources” (later revealed to be the General Staff HQ itself), the piece reported that high-ranking military officials were distressed. Traditionally, the Turkish military’s general telegraphs its discontent via big capital’s main media outlet, Hürriyet, whenever it intends to warn or depose the government. The report caused a firestorm. In the ensuing days, everybody waited with bated breath for another coup attempt. Pro-government ideologues and officials steeled themselves in preparation for a possible coup. Things calmed down a bit, however, once everybody reexamined the substance of the article. It did not contain any direct threats toward the regime. It contained, rather, a critique of the military’s favorite party historically, the republican-centrist CHP, which had been criticizing the military leadership for moving too close to the AKP and tarnishing the military’s status. Looking even closer, it was clear that the military mainly sought to defend itself against the suspicion that it was pursuing actions that were outside its duties. If anything, the massive wave of panic and threats from the pro-government camp in the days after the article’s publication demonstrated that they’re entirely aware of the fragility of the current power relations. The relationship between the MHP and Perinçek’s VP is also becoming tenser. This was first apparent when the MHP (majority) was opting for Yes, while the VP was simultaneously beginning to campaign for No. The disagreement came to the fore when Bahçeli declared that he would prefer the AKP to VP’s naysayers; Perinçek replied by accusing Bahçeli of having “done nothing for the Turkish people and state.” Erdoğan, for his part, applauded Bahçeli. It seems that a more serious struggle between the AKP/MHP and VP for control over central positions in the state (especially the military) is imminent. But while the AKP and MHP seem to be on the same page with regard to the VP, fissures are opening in the alliance between the AKP and the MHP. The AKP has long had a Kurdish voter base that it tries to mobilize — especially around election time — by appealing to its conservative values and Sunni identity. To bolster their position, they trot out collaborators (e.g., Kemal Burkay) or invite high-ranking members of the Southern Kurdish Barzani clan to Turkey. This time around, the AKP chose to invite Masoud Barzani, the president of the Iraqi Kurdistan region and the de facto leader of the clan. Bahçeli was infuriated to learn that the flag of the Kurdish Regional Government had been hoisted alongside the Turkish flag in the welcoming ceremony. Whenever they placate one group, the AKP upset another. There are fissures everywhere. Whenever the AKP are seeking “yes” votes from nationalists, they’re having problems with the MHP minority (Akşener) and the VP; whenever they’re making a play for the Kurds, they’re having problems with the MHP majority (Bahçeli). Leading pro-AKP intellectual Abdulkadir Selvi is already warning the AKP not to trust the MHP too much as it would drive away Muslims and Kurds. While the AKP and Erdoğan can be said to be taking a fascistic leadership role — taking more and more control of the legal political sphere — the fascization of society is not progressing in the same way. And for any fascist dictatorship to work smoothly, a strong fascization of society is paramount. It’s not for lack of trying. Erdoğan and the AKP have been attempting to do so for quite some time. Anti-feminism has been legitimized, all opposition is treated as terrorism backed by evil powers (or the PKK), there’s talk of reintroducing the death penalty, and political confrontation has grown immensely brutalized, with Erdoğan himself calling for national mobilization “against terrorist organizations” (in practice, an ever-growing list of oppositional forces), poking out the eyes of the enemy, deriding No voters as terrorists, and threatening Europe. All these moves aim at barbarizing social relations and fostering the most reactionary, most authoritarian reflexes within the population. Yet Erdoğan still hasn’t achieved the desired result. The dynamics of resistance are palpable. Political activists speak of an atmosphere “close to June 7,” referring to the parliamentary elections of June 7, 2015. Before those elections, the general political and social atmosphere was festively oppositional, and streets turned into a carnival of the oppressed for some time after the polls had closed. These days, it is of course not possible to be as visibly resistant on the streets, with some exceptions (such as the feminist movement). But the oppositional sprit hasn’t been quashed. People are afraid to join mass demonstrations or to voice their discontent too loudly, but they are as interested, as oppositional, and as angry toward the powers that be as they were back in the summer 2015. While repression has been fierce, resistance never died out. In early 2016, a group of more than one thousand academics spoke out against state terror and war in the Kurdish southeast. Massive repression has been visited upon them, but they remain largely unbowed. In nearly every Turkish city, they are building up “solidarity academies”; in foreign countries, they are self-organizing. The feminist movement has weathered the repression quite well, holding two huge demonstrations in recent months. Spontaneous if somewhat small-scale workers’ strikes are continuing. Democrats from various camps (socialist, Kurdish, liberal, republican) have come together to hold demonstrations when they can. In the lead-up to the referendum, a massive surge in social media activity has promoted No and displayed the humor and wit of the 2013 Gezi Uprising. “No committees” have sprung up in all quarters of all cities, actively campaigning for a “no” vote, encompassing organized militants and individual democrats alike. It is true that the other extreme is also taking place: i.e., a growing number of fascizised fanatics and trolls roaming the streets, social media, and television hailing their LEADER (REIS in Turkish, always written in capital letters). However, we should not forget that at this point, all public media and close to all private media are pro-government, so their coverage paints a distorted picture of the facts on the ground. It is also true that the AKP is arming some of its own members and militia gangs, who at times come down to the streets and threaten No campaigners, sometimes with live ammunition. However, illegal armed formations like the AKP’s Ottoman Hearths are nothing compared to Hitler’s SA or Mussolini’s Black Shirts. While the SA and the Black Shirts were successful in suppressing all dissent by terrorizing even slightly dissident elements within society, the pro-government armed gangs in Turkey currently lack the numbers, power, and organization to stamp out all democratic, antifascist reflexes. The potential for resistance still runs strong. Without a mass fascist organization, buttressed by mass militias on the street, any would-be fascist leader will be seen as structurally weak — especially by allies, who begin to think they might just be able to usurp the leader. Another important element that makes the current fascization process a weak one is the complete failure of Turkey’s foreign policy. Turkey had already lost the initiative in the Middle East before the coup attempt. After the failed coup, Erdoğan ordered the invasion of Northern Syria (“Operation Euphrates Shield”) in order to thwart the Kurds’ radical efforts in Rojava and to present himself as a strongman in the interior. The international powers involved, as well as the Syrian government, granted Turkey some latitude: they were allowed to block the Kurdish cantons’ unification, but nothing more. Turkey was explicitly commanded to stop assisting anti-Assad rebels in Aleppo and to desist from calling for an end to Assad’s rule. Time and again, Turkey tried to go beyond these constrictions and was confronted by the US and Russia. The ineffectiveness of Operation Euphrates Shield had an even more important consequence. Turkish plans to attack Raqqa by excluding the Syrian Democratic Forces (SDF) — which is dominated by the pro-Öcalan Kurdish YPG — were totally rejected by the US and Russia. Turkey and Turkish-backed FSA units clearly lack the capacity to effect meaningful change on the ground. It is important to emphasize — contrary to the claims of some leftists that the Kurdish forces in Syria are allies or agents of US imperialism — that the Kurds’ tactical alliances with other governments have not prevented them from forging an autonomous course. They have been able to do so based on their military and political capacities, as well as their diplomacy. At this point, all three forces are defending YPG/SDF areas around Manbij against a possible Turkish invasion, and it is the SDF, in cooperation with the international coalition and US special forces, that is starting the campaign to retake Raqqa from ISIS. Turkey, by contrast, has no say in the Raqqa operation. And after the US, Russia, and Syria deployed troops in Manbij, Turkey was forced to end Operation Euphrates Shield. Up until now, the EU, and especially Germany, have been very soft on Erdoğan. That’s because they recognize that Turkey is an important location for investment (80 percent of foreign direct investment in Turkey comes from EU countries) and see Turkey as a geostrategic hub that allows them to exert influence over the Middle East and guarantee a diversification of energy inputs (i.e. energy independence from Russia). Erdoğan, fully cognizant of this dynamic, is pushing the utmost limit of what is acceptable for the EU in order to, again, cast himself as the strongman who protects the Turkish people’s interests against “fascist Europe.” For the EU, however, Erdoğan’s taunting is about to reach a level that implies a serious loss of influence and initiative: the longer a dictator with much less power than the EU is able to taunt it unchallenged, the greater the likelihood that more dissident member states of the EU (or enemies of the EU) will no longer take them seriously. This is hardly something that the crisis-plagued EU could risk. On the other hand, if the Turkish government retains any semblance of rationality, it would be best advised not to risk heavier sanctions, since its economy and military are tightly bound to Europe (and the Western advanced capitalist world in general). Any harsher responses by the EU could swiftly trigger an economic crisis in Turkey (and in Europe as well). And any real turning away from Europe would massively damage the biggest factions of finance capital, who are closely entangled with European finance capital. Finally, Turkey is increasingly becoming a playing field of great powers. Sure, the assassination of Russian ambassador Andrey Karlov last December may have been carried out by a genuinely autonomous al-Nusra cell; Russia’s bombing of Turkish military positions in Northern Syria while the new CIA chief, Mike Pompeo, was making his first trip abroad to Turkey could have been a coincidence. Or they could indicate that the US and Russia view Turkey as a place to act out their contradictory interests through various means. In any case, these events show that the Turkish state is losing control over its own elements and territory. A state whose own apparatuses are subverted by cells, whose military can be disciplined by greater powers, and which is not able to guarantee the safety of foreign diplomatic personnel, will swiftly lose its magical aura of eternal existence and omnipotence. Lastly, the economy is ailing. The economy has been flagging on many fronts, even according to indicators that often conceal capitalism’s ills. With a late-developing capitalist economy that has never successfully qualified as internationally competitive, Turkey is very much dependent on importing raw materials and capital goods for domestic production and exports. Since the onset of the neoliberal period, the Turkish economy has also become dependent on external finance for credit, privatization, and investment. All these factors render the country’s economy highly sensitive to external changes, particularly those of exchange rates. As a result of political and economic prospects, tensions in domestic and foreign policy, and the increasing difficulty of securing stability and sustaining social consent, the Turkish lira has depreciated a full 100 percent against the dollar since March 2013. What makes the exchange rate so central is that the private sector’s external debt stock is $293.7 billion, out of which $86 billion is short-term. To put that in perspective, the country’s GDP is just $850 billion. Similarly, economic sanctions and import limitations imposed by Putin after Turkey downed a Russian warplane in late 2015 destroyed trade between the two countries — a disproportionate hit to Turkey, which used to count Russia as a top ten importer of its goods. Many of the economic sanctions are still intact. More importantly, a range of factors — Turkey’s failed military adventurism in the Middle East, the consequent increase in bomb attacks and jihadist cells in the country, the never-ending fights with almost all of its neighbors, the domestic war being waged on the Kurdish movement and its people — have driven down tourism, which historically has accounted for more than 20 percent of the country’s exports. Both the number of international tourists visiting Turkey and overall tourism revenue declined by 30 percent last year. How about the material conditions of labor? Real wages and productivity have been slowly increasing as a whole. However, the ratio of household debt to disposable income jumped from 7.4 percent in 2003 to 55.2 percent in 2013. Similarly, the ratio of household liabilities to assets was around 50 percent in 2016 — the highest level in Turkey’s history. Just like in any other country, it is not a question of if but when this ever-accumulating debt will spark turmoil and instability. Lastly, unemployment as measured by the mainstream indicator is 12.7 percent as of December, while the more realistic unemployment rate is up to 19.1 percent. The Turkish government’s policy attempts to revive the moribund economy have only been palliatives: subsidizing certain industries and firms; stimulating domestic demand through measures like a minimum-wage increase; offering tax cuts for real-estate purchases; facilitating credit access for small businesses and households; adjusting the term, structure, and interest service of existing debt stocks; converting dollar liabilities to lira at a fixed exchange rate; and so on. All these policies aim at saving the day rather than dealing with the underlying sources of the problem — even from a bourgeois economic framework. As the newest would-be buffer to the eventual crisis, the government has established a wealth fund and transferred public assets and companies worth billions of lira to itself by statutory decree. The government announced that the wealth fund will be managed in accordance with a strategic investment plan. What’s striking, however, is that there will be no supervision or transparency for the fund, let alone any mechanism for democratic control. One potential use of this fund is to finance Erdoğan’s crazy “mega-projects” that help sustain his popularity. Another would be to serve as a “substitute Central Bank” in the face of exchange market fluctuations, especially when “speculative operations, economic sabotage, and attacks intensify,” according to Deputy Prime Minister Nurettin Çanıklı. The fund could additionally be used for bailout operations, or to help private firms roll over debt (the government is guarantor of their external borrowing). Given its massive assets (which can be used as collateral), the fund will also help the government borrow under favorable conditions, and hence alleviate some funding and borrowing burdens, as Finance Minister Naci Ağbal has pointed out. In short, the government is well aware that hard times are approaching, and it is trying to take certain mitigating steps. It hopes to wait out the current threat of crisis, establish the presidential dictatorship, and stabilize the hegemonic order as much as possible. But their dreams of authoritarian tranquility seem rather far-fetched. Even different factions of big capital — not to mention democratic and revolutionary forces — recognize the underlying instability. The central lobbying agency of Turkish big finance capital, the Turkish Industrialists and Business Association (TÜSİAD), has expressed its concerns about ongoing militaristic policies, called for an end to the state of emergency, and questioned the sustainability of rolling over the ever-increasing debt. It is especially worried about the intensifying and massively damaging row with Europe. On the other hand, it is the same big capital that states its pleasure with the government’s massive subsidies to investors. In fact, they are not even against a presidential system as such. In line with pro-capitalist dogma, they would love to see a more technocratic, less democratic state structure. They are just opposed to Erdoğan’s arbitrary misuse of those powers. In other words, they are against a political subject who is not wielding the state the way that they wish. TÜSIAD finds Turkey’s rapidly deteriorating relations with Europe, and the advanced capitalist world more broadly, especially concerning. If Erdoğan and the AKP pull away from these countries after the referendum, it would be devastating for Turkish big capital. Still, they are too spineless to fight for an alternative. For big capital, Erdoğan is like the powers conjured by a wizard who then loses control over them. Big capital would give anything for an alternative political subject to take power, as long it was as dedicated an advocate of pro-capitalist policies as Erdoğan and the AKP have been since 2002. That’s not to say the AKP is lacking in staunch business support. The more conservative-Islamist capital factions — which have thrived under AKP rule — are solidifying their role as the government’s chief capitalist partners. For instance, in response to Erdoğan’s call for employment expansion, the Independent Industrialists’ and Businessmen’s Association (MÜSİAD), which is very close to the government, declared that each of its fifty thousand members would hire five more workers. At the same time, the biggest capital groups represented in MÜSIAD are deeply entangled in the so-called mega projects, with high levels of indebtedness in foreign currencies. As such, any economic turmoil would hit the more organic pro-government capital factions the most and the hardest. On the eve of the referendum, uncertainty prevails. Erdoğan’s government, though despotic, has both failed to present itself as strong enough to win majority support for its fascization program and to exert sufficient terror to quell the substantial dissent that remains. It is highly likely that the referendum will be close, and that Erdoğan will put his thumb on the scale. A No victory, by itself, would not stop Erdoğan’s fascization drive — he cannot risk falling from power, and he and his clique have disregarded any “legal” defeats over the last few years. The government’s hegemony is very fragile, and vulnerable to crises of various sorts. A Yes win won’t change this, at least not in the short run. Still, a Yes victory would cause some demoralization and perhaps even occasion the retreat of many elements within the democratic and socialist movement. Resignation might spread. We know from internal sources that the AKP thinks that a Yes win, and the attendant restructuring of the state, would only be the beginning of more sweeping steps. The potential result would be another crisis, precipitated either by a war between the various reactionary cliques entrenched in the state, or because of a conflict between the government and external powers. While it’s impossible to divine what exactly the crisis would look like, we can be sure it would be very nasty. More and more, AKP members of parliament would begin to express skepticism and critiques. The already existing and sometimes high-ranking dissidents within the AKP would gain strength. In one way or another, the bourgeoisie would look for a more acceptable alternative and seek to secure it in a more decisive fashion. While CHP leader Kemal Kılıçdaroğlu has declared that “nothing would change” if No came out on top, the informal leader of the CHP left, Rıza Türmen, has declared the opposite. He’s insisted that a No victory would also be a victory against authoritarianism. A win for No would, according to Türmen, militate in favor of a democratic style of politics in Turkey, as well as the creation of a new constitution guided by peace, pluralism, and power-sharing rather than centralization. With his approval and support of the popular democratic potential of the “No committees,” Türmen has emerged as the champion of a genuinely left-wing version of bourgeois democracy. But then there is also the aforementioned Meral Akşener, leader of the minority MHP. Though a staunch fascist, she has also adopted a “democratic” discourse to a certain degree. If she became a powerful leader within the No camp, a much more toned down and nationalist version of bourgeois democracy — perhaps more or less the same, but with less arbitrariness — would reign. Ultimately, the way things evolve after a No vote would turn on the status of popular power. In the current environment, it does not seem likely that a people’s democratic alternative could be forced upon the bourgeoisie. However, it is likely that any bourgeois alternative would have to at least concede to some popular demands (reinstating political freedoms, ending political jurisdiction, ending social polarization, etc.) in order to be legitimized. Any reopening of the social and political spheres — i.e. an end to the dictatorial closure and sanctioning of all dissidence in the public sphere — will release those antifascist and democratic potentials and reflexes from their prison. That will be the moment when organized power will be able to achieve the most, when the bourgeoisie will have to make the most concessions in order to remain in power. The more sweeping an alternative that people’s organization can, in such a moment, force upon the bourgeoisie, the greater the chances that it can push even further towards a situation of dual power or something similar. Now is the time to organize and activate as many popular forces as possible, to draw on the No committees and the social media wave and position ourselves for the struggles to come. Neither has the spirit of the Gezi Uprising vanished completely nor has the relentless Kurdish struggle succumbed to the brutal war waged against it. These social forces bear within them the seeds of a popular democratic alternative. Tomorrow’s referendum in Turkey is about one thing: Erdoğan’s brazen bid for dictatorial power.